Wearing your hair in a half-up, half-down style isn't a radical new trend. Cast your mind back to playing on swings with your siblings and your hair was probably loosely fastened in some kind of Mary-Kate and Ashley Olsen–inspired half-pony with the other half falling down your back and becoming increasingly knotted because your mum couldn't keep you still long enough to brush it. Before then, the likes of Madonna and many other '80s icons danced about on stage, whipping their half-up ponytails around, secured in scrunchies that wouldn't look out of place on a Ganni model these days. This hair trend has been around for longer than we can remember, but it just so happens we've noticed it trending in a major way on social over the past few weeks. 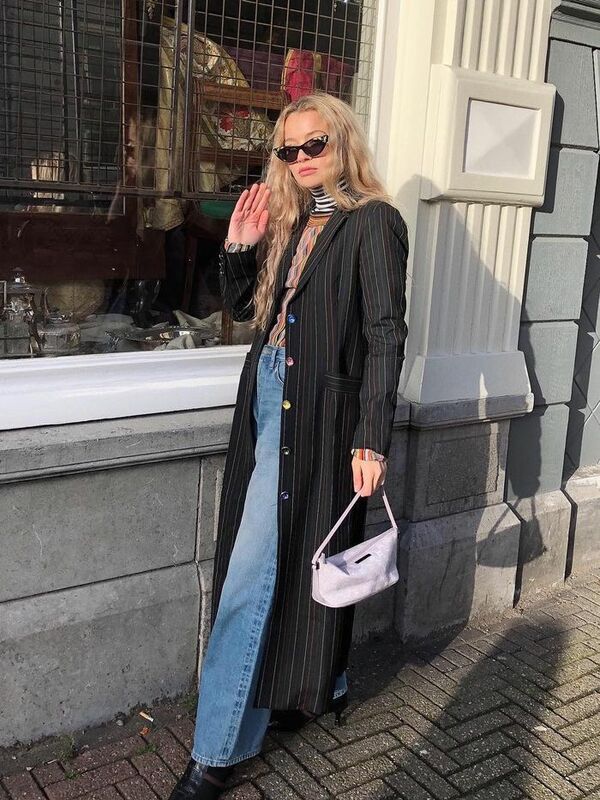 So we wanted to show you just how versatile the half-up, half-down trend is because more often than not, the way we wear our hair plays a huge part in how we feel in any given outfit. And considering most of us don't have time to burn each morning, we need a speedy fix. Enter: a 30-second hairstyle that suits everyone. Below, six editors show you how it's done. Oh, and, naturally, we had to adorn these looks with some attention-seeking accessories, too. Because that's 2019's hair method. Being cursed with fine hair means oversized scrunchies and big hair accessories look ridiculous on my strands, so I generally opt for smaller-sized ones. By waving my hair first for volume, I was able to take the top layer of my hair fully back off my face and give the impression of thicker hair. I then used a volume powder to up the ante a bit on my roots post tying it up. Add some statement earrings and voilà, you're good to go. Shop my hair picks and earrings below. This three-barrel styling wand is perfect whatever your hair, or style preference. Remember: The bigger the barrel, the looser the wave. Volume Powder is a fine-haired girl's BFF. I love this Sachajaun one, as it gives the hair texture without making it feel gritty or weighed down. I dust it in my roots then zhoosh it with my fingers. If your hair is up, it would be rude to not deck your ears out with giant crystal-embellished earrings. These Rosantica ones are the perfect hybrid of classic and statement all rolled into one pair of cute clip-on earrings. Some might worry that the whole half-up, half-down thing might make you look like it's 7 a.m. and you're about to do your skincare routine, which is why Emma opted for a style that still had face-framing bits left out at the front. 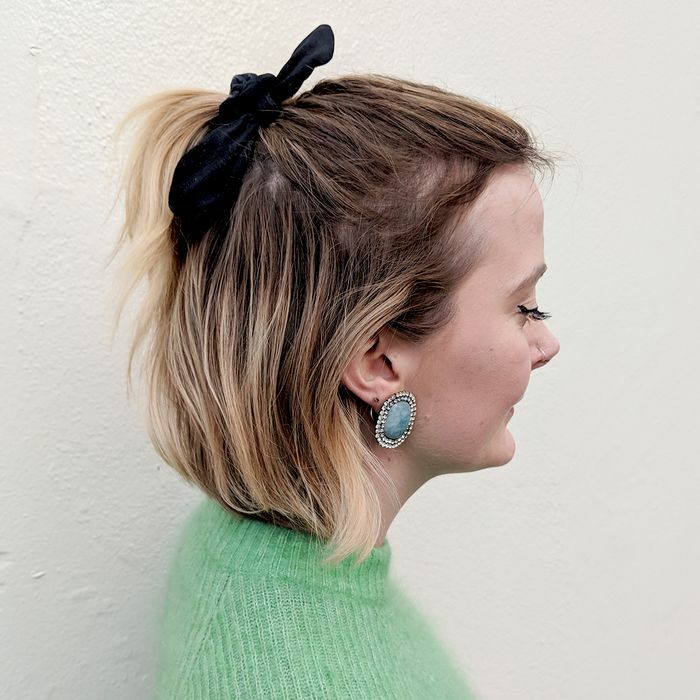 "Wearing a smaller section of my hair quite high, on the top of my head, made it look less scruffy, and I found the silver Saskia Diez hair tie worked better in my thick hair than a scrunchie, which looked a bit too much like 'sink hair' to me," she says. If, like Emma, you have a slight curl to your hair, run some defining cream through towel-dried hair to bring out the texture. Shop her hair essentials below. Giselle wears a wig and often curls it, which leaves little room for switching up her style, but she loves simplistic looks so this subtle hair tie worked perfectly: "I wanted to keep it simple and use the accessory to add some volume to my roots and push the hair back from my face. I'm into it." Shop the products Giselle uses to prep her wig below (and her hair tie) below. This conditioning hair oil helps to restore your hair's shine and moisture levels. Apply it to damp hair for best results. Giselle secured her half-up, half-down style with this chic hair tie for an added pop of silver. Mica's hair is naturally quite curly, which makes for the perfect base for half-up, half-down hair, as it has lots of grip. Mica told me that she loves this 'do because it's the fastest way to look like you've made an effort to style your hair when in reality it's only taken you seconds. "I've always thought that a topknot has major cool-girl vibes, but as someone that likes wearing my hair down, this is the perfect compromise. It's a great option for second-day hair too, as a bit of grit gives the style extra texture." Shop the products Mica used during her washing process below. Most shampoos strip dry hair of any moisture, but this repair shampoo uses hydrolysed keratin and wheat proteins to penetrate the hair and repair any damage, leaving it soft and silky. Mica uses the same conditioner from The Kure range to ensure her hair is as soft as it can be before using elastics to tie it up. This rich conditioner contains a blend of ingredients to nourish even the most frazzled ends. Adorn your hair with crystal hair slides to add a touch of sparkle to your half-up, half-down look. These diamante slides would look great worn solo or piled up like those girls you see on Instagram. Joy's hair is short and has a natural subtle wave to it, which helps to give it a more modern finish when styling. Since going for the chop, she's more drawn to wearing it down or in a low bun but told me it needs dry shampoo for texture and a little teasing. "I might just be converted to the whole half-up, half-down thing," she added. Shop the products Joy loves for this look below. The hair half-up, half-down look can be a saviour for second-day "I can't be bothered to wash it" hair, which is why dry shampoo is a must. Joy loves this volume one to give her hair an extra boost. Add pearl-drop earrings to your half-up, half-down look and you're good to go. Who What Wear Editor in Chief Hannah Almassi had amazing long hair but now has amazing short hair, as she's recently gone for the chop, but she claims it tends to fall flat even with styling. With the '80s and a scrunchie in mind, she pulled a ponytail on top of her head to build some volume: "I'm an all-or-nothing kind of outfit-builder, so I preferred to dive headfirst into a more retro look rather just subtly dip a toe in." Use hair spray if, like Hannah, your hair tends to fall out after styling. Shop Hannah's favourite products below. Rixo doesn't just design everyone's favourite printed dresses. The brand's accessories section is well worth a scan, too. The scrunchies are perfect for lazy girls who want to add a bit of fun to their hair. If you're after volume and hold, Ouai's Volumizing Hairspray is the product for you. This suits-all spray is the secret to that perfect tousled texture and takes seconds to use. Simply spritz and go. Unfortunately, Hannah's Sézane shell earrings are sold out, but carry on the '80s vibe with these oversized marble-effect plastic earrings. Next up, these are the 10 cult pieces the street style set are wearing at fashion week.